Another book, I am finally getting around to reading after being told to read it ages ago. 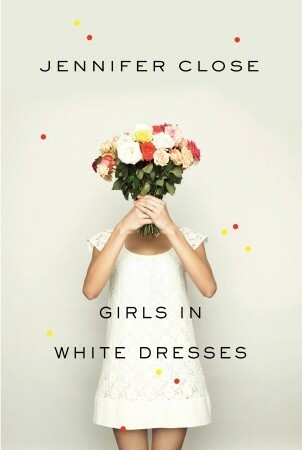 Girls in White Dresses is about three friends who try to navigate their twenties, climb the corporate ladders, and avoid heartbreak, all while attending countless engagement parties, wedding showers, weddings and baby showers. I am that annoying girl who loves to host parties, attend parties, be the center of parties, but I can still relate to feeling of thinking everyone who possibly know is married, just to get another invite in the mail. It can definitely get exhausting. The real story in this book, is about the struggle of hanging on to your friends even though life is pulling everyone in different directions. Being 26 myself, it’s a struggle I face daily.The book skips around a lot. years pass in a couple of pages, but even that aspect makes the story more believable. Because that’s how it feels in real. You blink and your best friend is married, you blink and another friend is moving half way across the country, you blink and suddenly you are mother of two. I loved this book,and I encourage all my fellow 20-somethings to read it. Not because the writing is so spectacular but because it reminds you that it’s okay. It’s okay to grow up, to pursue your interests, do your own thing, be in relationships even if your friends are single. Not only is it okay, but it’s possible to maintain friendships through it all. It’s going to be okay. This entry was tagged chick lit, east coast, friendship, funny, girlfriends, Girls in White Dresses, Jennifer Close, New York, twenty-somethings, women. Bookmark the permalink. I added it to my To-Read-List. How can you read so many books so quickly??? Well, I am a fast reader but I also don’t sleep, which is becoming an issue and I wouldn’t recommend it!